Who Put Thermite In The World Trade Center? In The World Trade Center? · the second on the 81st floor of the South Tower. · Were the computer rooms equipped to play a role in the crime? · Were there homing devices or computers in these rooms that used precision-guidance systems to direct the planes into the towers? 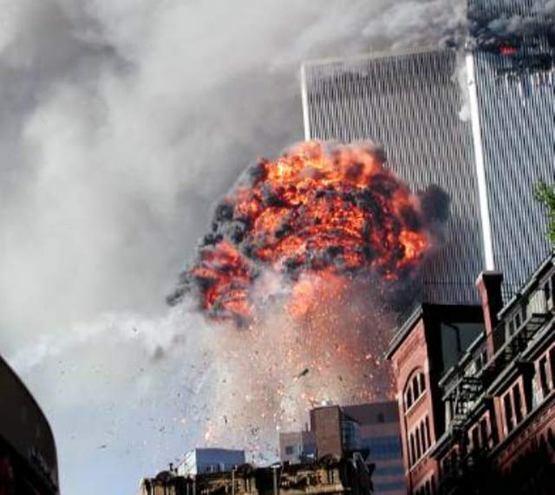 · Did these computer rooms contain pre-placed explosives or forms of Thermite to destroy evidence, create an incendiary spectacle, and weaken the structure prior to the collapses? 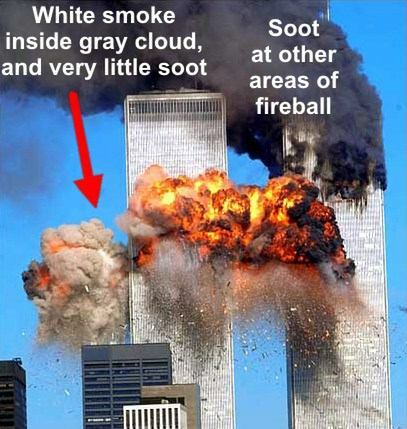 It could not have been molten aluminum as the federal government's Final Report on the Collapse of the World Trade Center Towers (NIST, 2005) speculates, Jones says, because, among other things, molten aluminum at that temperature would appear silver-grey in daylight conditions. The Thermite reaction produces an extremely hot reaction (up to 2500 °C or 4500 °F), which creates molten iron and aluminum oxide. The molten iron produced from Thermite is white hot and the aluminum oxide is a white smoke. Eutectic comes from the Greek word "eutektos," which means "easily melted." Thermate cuts through steel like "a warm knife through butter," Jones says. The FEMA-sponsored Building Performance Study of 2002 contains evidence of melted steel caused by sulfidation and oxidation. This is found in the "Limited Metallurgical Examination" written by Professor Jonathan Barnett. 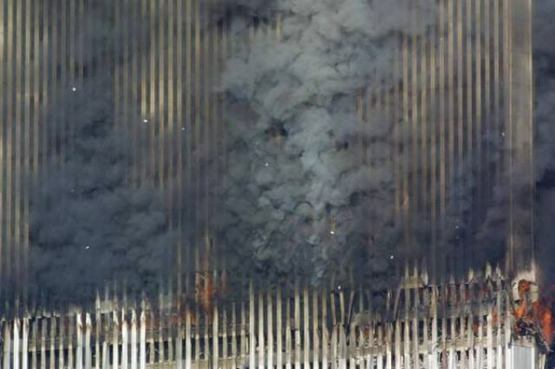 The NIST report, however, fails to address the evidence of sulfidation found in the structural steel from the WTC. Barnett examined two pieces of melted steel: one from the WTC 7, the other from the Twin Towers. About the first piece, Barnett wrote: "The thinning of the steel occurred by a high-temperature corrosion due to the combination of oxidation and sulfidation." This was done by "a eutectic mixture of iron, oxygen, and sulfur that liquefied the steel," he concluded. Barnett found the same sulfidation in the piece of melted steel from the Twin Towers. "The severe corrosion and subsequent erosion of Samples 1 and 2 are a very unusual event," Barnett wrote. "No clear explanation for the source of the sulfur has been identified." Professor Jones points to Thermate, with 2 percent sulfur, as being the most likely culprit. The oxidation and sulfidation of the steel requires the oxygen and sulfur being "intimately in contact with the metal at high temperature," Jones said. 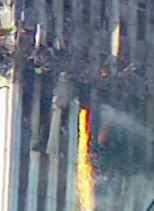 The molten iron seen falling from the South Tower's eastern corner before it collapsed must have weighed many tons. One cubic meter of iron weighs about 8.5 tons and it certainly looks like several cubic meters poured from the 81st floor shortly before it collapsed. But what could have been the source of so much iron on the 81st floor? 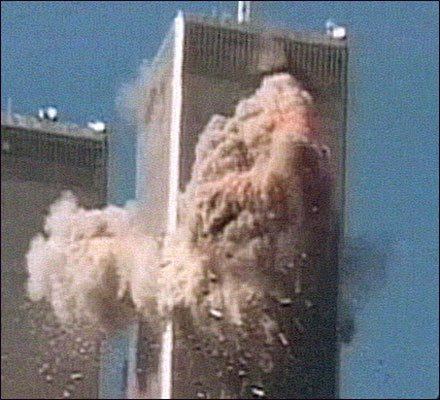 "There were vigorous fires on the east side of the 80th through 83rd floors, especially on the northeast end of the 81st and 82nd floors, where the aircraft had bulldozed the office desks and chairs and added its own combustibles," the NIST report says in its "Account of WTC 2." From the NIST report the reader gets the impression that these were normal office floors with "desks and chairs," although that was definitely not the case with the 81st floor while the contents of the 82nd and 79th floors remain unknown. Fuji Bank was the tenant of floors 79-82, yet for some reason the NIST researchers were unable or unwilling to provide any description of the contents of these crucial floors ­ four years after 9/11. These units were bolted to a raised floor about 3 feet above the reinforced 81st floor. "The whole floor was batteries," he said, "huge battery-looking things." They were "all black" and "solid, very heavy" things that had been brought in during the night. They had been put in place during the summer prior to 9/11, he said. Were these batteries the source of the molten iron seen falling from the 81st floor? Was Thermate in these "batteries"? Is there evidence to prove Thermate was used on the 81st floor? This white flash is evidence of a pyrophoric white-hot uranium penetrator, which bores through everything it hits and creates a super-heated space as it burns at extremely hot temperatures. Asked if a white-hot DU penetrator would set off Thermate, Jones said, "Definitely." While the orange and black fireballs caused by the burning jet fuel are easily recognized in photographs, there is visible evidence of Thermate seen in the dust and smoke ­ the conspicuous white smoke of aluminum oxide. On the 95th floor of WTC 1, Marsh & McLennan had a "large walled data center," a secure computer room along the north and east sides of the tower. And that's exactly where the plane hit ­ the north wall of the 95th floor. Professor Jones, when shown this photo, said, "It looks very much like aluminum oxide dust." The white smoke is clearly coming out of the east side of the building and is also seen behind the orange and sooty cloud that is rising on the north side of the tower. Isn't it odd that the explosion, which was supposedly caused by jet fuel combusting in the middle of the building, did not affect the western façade as it had the eastern? Is this where Thermate incendiary devices had been placed ­ in the computer room of Marsh & McLennan? If Thermate bombs had been pre-placed in the 95th floor computer room, who put them there? "The fireballs burned for 10 seconds, extending almost 200 feet out from the north, east, and south faces," NIST reports. "Having consumed the aerosol fuel, the flames then receded." From the south face of WTC 2, the "dust clouds" that emerged look nothing like combusting jet fuel. They look much more like the white smoke of Thermate than burning kerosene.